The number of freelancers -also called in Spain ‘autónomos’- is on the rising. According to the latest figures released by the Spanish government every day more than 70 people become freelancers, a direct consequence of the current situation of the job market. More than 25% of the Spanish workforce is unemployed and the future for the young doesn’t seem too bright, with 50% of those under 25 being unable to find a job. So, instead of trying to work for someone else, more and more people have decided to take matters into their own hands. And while working from home is the cheapest alternative for freelancers, coworking spaces have become a viable option for most. The first coworking spaces appeared in San Francisco in 2005. Freelancers and young startups looking for an office decided to share a common space to save money and, more importantly, to be surrounded by similar workers. In exchange for a monthly fee that in most cases ranges from 50 to 250 euros, coworkers get access to an office environment, Internet, coffee and meeting rooms. The tendency towards this working model can also be explained from psychological point of view. According to various recent studies, being surrounded by similar people increases productivity in comparison to working alone at home: more distractions and fewer social interactions that can lead to boredom and, what’s even worse, solitude. All of these factors combined help explain the rise in coworking spaces all over the world, including Spain. 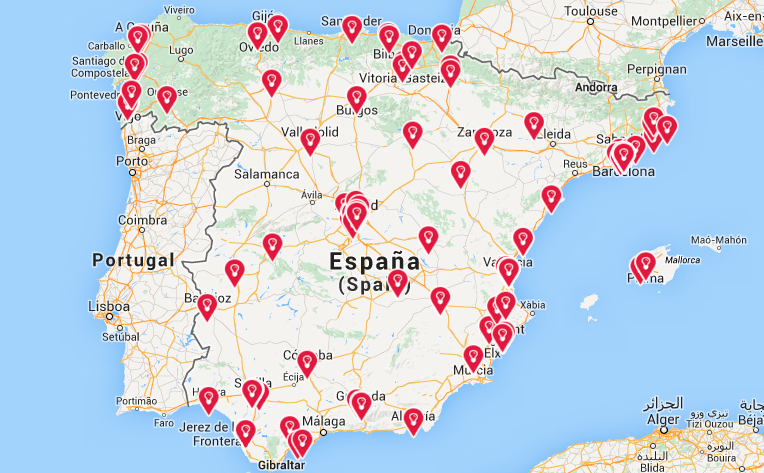 The first coworking spaces appeared in Spain in 2007 in the main cities but, as visible on our maps, right now it’s tough to find a city -small or large- that doesn’t include one of these offices-on-steroids. According to data from CoworkigSpain there are now more than 400 of such spaces in the country -with Madrid and Barcelona accounting for half- and 7,000 freelancers. Considering that the number of self-employed workers will only rise from now until 2020, we can only expect a similar increase in the availability of such spaces. Within the coworking ecosystem one can find a wide variety of spaces, from those that are closely related to the world of Internet startups to others that welcome any kind of workers from various backgrounds and fields, creating a diversified and enriching environment that can benefit workers. The vast majority of coworkers also tend to offer events and conferences in a way to contribute to the professional development of its members and also the outside community. As aforementioned, coworking spaces have been linked to the world of startups from the very beginning, when they started to spread all over San Francisco. And that connection has been reinforced in recent years with the boom in technology startups in Western countries and also in developing markets. It’s important to highlight the relevancy coworking spaces can have in the latter, acting as institutions that help connect similar types of workers in ecosystems that have yet to develop a proper startup scene. With more than 400 spaces in the country, choosing the best is a challenge. Therefore we have decided to select a few that we personally like and enjoy, while we let it to yourselves to find others that might better fit your needs. There are a ton! As we previously said, CoworkingSpain and Startupxplore are two great resources to browse through what Spain has to offer in terms of coworking spaces. Impact HUB is a global network of coworking spaces, with 54 all over the world and more than 7,000 members. In Spain they have offices in Madrid and Barcelona, housing not only freelancers but also startups such as Ironhack or The App Date. As is the case with most spaces, numerous events associated to creativity and technology are held at both HUBs every month. Utopic_US is also a good alternative in Madrid. More than 150 cowokers work from its offices in downtown Madrid and every week they put together events related to the world of arts and entrepreneurship. 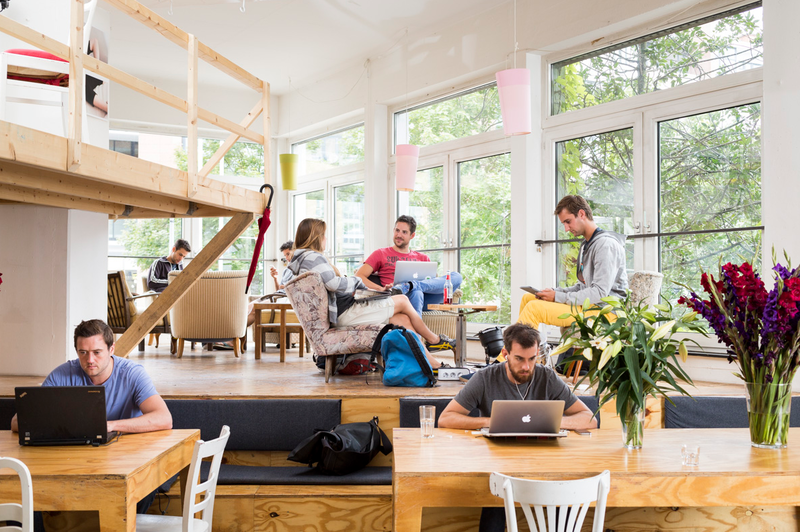 Betahaus started as a coworking space in Berlin but has since expanded to other European locations, including Barcelona. Located in a 6-floor building in the neighborhood of Gracia, Betahaus hosts workers from different backgrounds but with a special focus on creativity and arts. Check out some of its coworkers on their blog. Makers of Barcelona (MOB) is one of those coworking spaces that is clearly different from the rest. MOB is the place to be for those interested in 3D printing and other hardware-related ventures. As we’ve said in the past, the Spanish startup scene is in no way not limited to Barcelona and Madrid, and this is also visible in terms of coworking spaces. Two very good options in Valencia are Geekshubs -which is also an interactive agency- and Wayco; and up north, in Bilbao, we have co.lab and Bilbao Lab Coworking. Now that you’ve probably just returned from your summer holidays all relaxed and full of energy… are you ready to try new things and join a coworking space? Socializing and leaving your house from time to time won’t hurt you!